Parhedros designs task-oriented software applications that harness the incredible power of gameful design enhanced with personality-augmented interfacing to engage and motivate people to achieve their goals. Our products encourage people to take it to the next level in their personal lives by spending more time on the activities that are good for them, such as studying, planning for the future, organizing their taxes, and optimizing their investment portfolios. Our unique branding programs bundled into our applications further serve to create persistent, high-credibility interfaces between consumers with financial problems that need solving and real-world advisors. Once upon a time, people surfed the web for information on how to solve their real-life problems. Today, they know that there is an app for just about any data-oriented challenge they face, and they can access that app via the web. Does your practice's website provide static information, or does it offer dynmaic, real-time solutions to the problems that your clients and prospects are facing today? 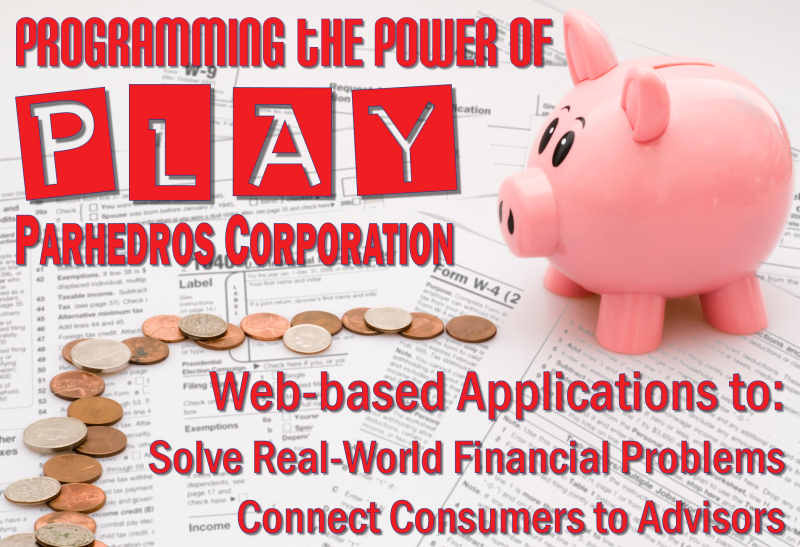 Parhedros designs sophisticated but fun-to-use software applications that help people solve complicated, real-world problems in the areas of money management, saving and investing, retirement planning, and taxation. We design interactive tools for solving to the financial problems that confront the sort of people who you want to do business with. Let's face it, life seems like a journey beset with financial problems to solve, and at the pinnacle of every successful solution to a challenge overcome, we are confronted with a wide panorama of further problems and challenges that lie ahead. At Parhedros, we celebrate the complexity of life and finances. Even as we provide today's digitally savvy consumers with ever more sophisticated problem-solving tools, we also take great care to educate our users on the value of seeking an experienced advisor to help solve those problems successfully and efficiently. We invite YOU and your practice to become part of the tool kit that we offer to today's consumers of financial services!